Three ways to turn black-on-white text to white-on-black. Craig Mod, a deep thinker about books, queried on Twitter about a way to invert black-on-white text to white-on-black in a PDF. There are a few ways to carry this out. 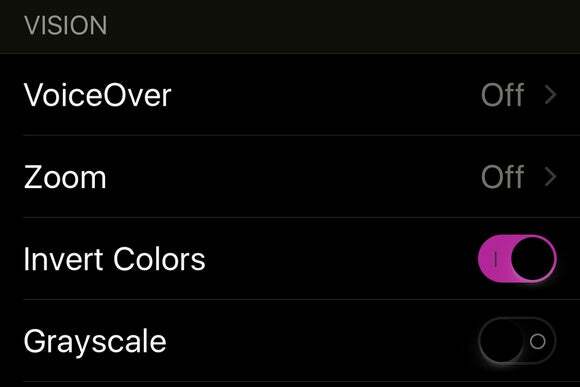 iOS Accessibility lets you set a triple-press to one of several options, including Invert Colors. Use the built-in iOS accessibility option. The General > Accessibility view contains dozens of features designed to make iOS more useful to a broader range of people than default settings can capture. One of the options that helps with certain forms of visual impairment is Invert Colors. Tap its switch, and the colors in the display invert. That’s useful if you need it all the time, but it’s a bit of a bear to navigate to that view and tap it on and off as needed. Fortunately, Accessibility hides another option that lets you assign behavior to a triple-press of the Home button. 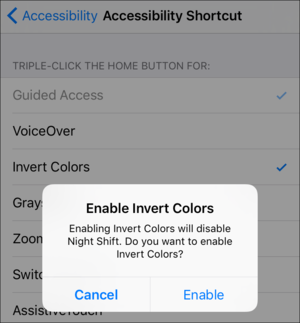 Swipe way down to Accessibility Shortcut, tap it, and then set the option to Invert Colors. Now you can easily invert with three presses. If you have a Night Mode schedule, you’ll be warned that inversion disables it while in use. Get a PDF reader that can extract text. 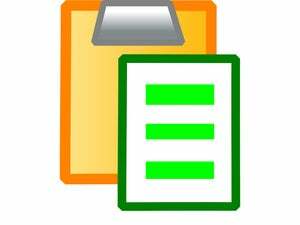 PDFs are designed for exact reproduction of what the creator of the file sees as they preview it, whether in a word processor, page-layout program, or specialized software. However, in well-created PDFs, the text is set up as a separate flow within the document, which can be used by accessibility tools, such as programs that read aloud the text of a PDF. Acrobat Reader for iOS offers a Night Mode to invert colors. 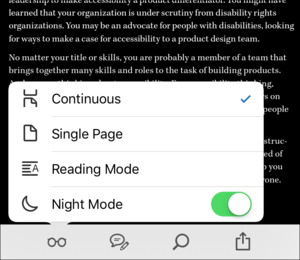 The official (and free) Adobe Acrobat Reader app has options for both viewing the text stream by itself and flipping into an inverted Night Mode. Open a PDF, tap the eyeglasses at lower right, and tap Night Mode, and voilà! That’s also where you can tap Reading Mode to scroll through plain text. You can also turn to other third-party apps. I’ve been fond of GoodReader ($5) for many years, because it’s a Swiss Army knife if there ever was one for handling documents of all sorts. It has a mighty peculiar user interface, but, once mastered, can carry out all sorts of tasks that you’d need multiple desktop apps to handle otherwise. With a PDF loaded, it can extract text and offers a text-reading mode with colors you can set for the text and the background.